You need to have Windows® Administrator rights in order to install Plug2Sync and Backup. Please check that you are running Microsoft Outlook 2002 (SP-2), 2003, 2007, or 2010 as Plug2Sync and Backup is incompatible with any Outlook version prior to 2002/XP (SP-2); check other System Requirements as well. You can update your Microsoft Outlook version here. 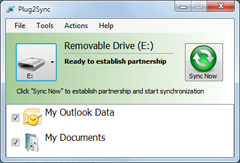 Download the latest version of Plug2Sync and Backup setup file and distribute among your PCs or team members. Install Plug2Sync and Backup by downloading and opening the "setup" file from the product web site http://www.4team.biz/. Follow the instruction on the screen. Installation is required on every computer that you plan to synchronize. You are now ready to start synchronizing your files and Outlook data! Just plug in the USB removable drive and proceed with your first synchronization. Important: The Program will start after the Plug2Sync installation is finished if the check box "Launch the program" is checked. If, during installation, you receive a message that recommends restarting your PC, please proceed with the restart, otherwise Plug2Sync will not be able to work correctly.